Director: Selma VilhunenWriters: Kirsikka SaariStars: Pihla Viitala, Ville Haapasalo, Rosa HonkonenSummary: An edgy, warm, and raw drama about suburban teenagers who unexpectedly have to deal with grown up problems of pregnancy, while extreme right ideas begin to encroach on their multicultural neighbourhood. 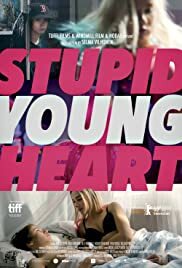 STUPID YOUNG HEART is about the first love between the skinny and carefree Lenni and the gorgeous and popular Kiira. Not yet in a relationship, nor out of highschool, they discover that they are expecting a baby. Lenni has nine months to become a man. Having grown up without a father figure, Lenni finds longed-for adult attention and guidance from an unlikely friend Janne, a member of a right wing group that has recently moved into Lenni's diverse neighbourhood. After taking part in a scrambled attack on a local Mosque, while Kiira is rushed to the hospital to give birth, Lenni realises that he must learn to be a man in his own way, even though he never had a chance to be a child himself.